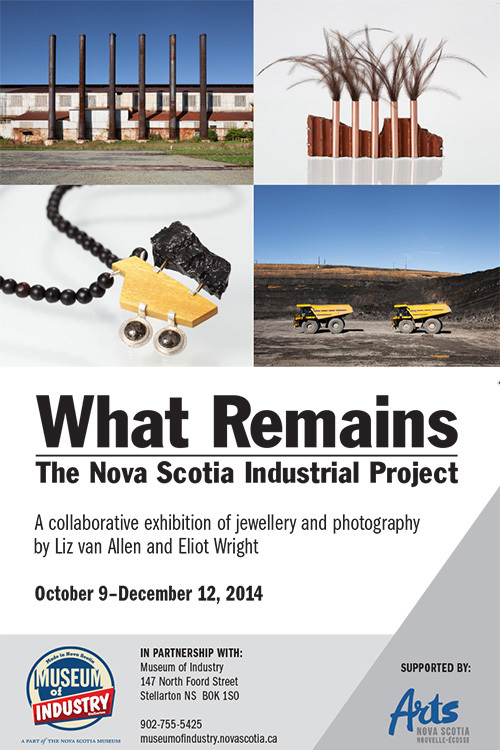 What Remains is a temporary exhibit of photographs of (mostly former) industrial sites, jewellery made from what is still at these locations, and artifacts associated with them from our collection. The Museum of Industry is excited to partner with van Allen and Wright to explore Nova Scotia’s industrial archaeology by combining art and artifact. Increasingly, evidence of our past industrial activity is disappearing from the landscape and so it has never been more important to document it in detail. These buildings, ruins, and materials of production are becoming a source of curiosity as they become less part of the everyday existence. The photography and jewellery of What Remains offers an important contribution to the ongoing conversation between industrial heritage and art. Throughout 2013, the artists toured numerous operational and abandoned industrial sites across the province, focusing especially on mineral extraction and refinement, steel production, and textiles. During these visits, Wright produced documentary photographs that reveal a captivating overview of Nova Scotia’s industrial landscape. Inspired by elements found at the locations and in the photographs, van Allen fabricated bold jewellery pieces, often directly incorporating non-traditional materials. This exhibition presents Wright’s photographs and van Allen’s jewellery pieces together for the first time. Their unique interpretation of industrial sites throughout Nova Scotia sheds new light on important aspects of our history, provides viewers with a multi-faceted look at our contemporary landscape, and focuses closely on connections between material and place. Bridging these media are artifacts from the Museum of Industry, collected from these or similar sites, broadening the conversation between art and industrial heritage. This exhibition reminds us of what once was, what has become, and What Remains. Eliot Wright and Liz van Allen would like to acknowledge Arts Nova Scotia for providing tremendous support in the development and presentation of this exhibition. Come for an hour or stay for the day. The choice is yours with a Nova Scotia Museum Annual Pass.